RetroMessenger is a easy to use and simple Instant Messenger to keep all your friends listed in a friendlist and to message them. All messages to your friends are secure and encrypted, so no third party is listening. You just need to swap with your friend a PGP-Key and you are done. RetroMessenger is encrypted out of the box, that means no difficult installation or extra-downloads for the encryption part is needed. 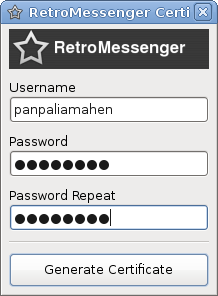 RetroMessenger does not need a central server. So the network never will be down or monitored by one central authority sending you adds or "weather notices". With RetroMessenger you are not on anyones "needle", you are only connected to your community.